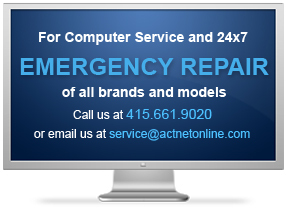 Actnet is a San Francisco based computer services company that specializes in fast and reliable solutions for your home and business. We are a team of competent IT and networking professionals who have years of experience with support for business and personal computing. Locally, we are well known for swift and effective response to a variety of technical emergencies which include data recovery, software failure, hardware failure, network outages, and peripheral repair. Our pledge is to provide dependable, affordable solutions by listening closely to our customers and finding any problems ASAP. Aside from our quick repair service, we are also recognized for building custom computers, taking trades of old laptops and desktops, and for selling a large selection of computer parts and accessories. Find out why local businesses of every size and specialty use Actnet as their one stop shop for complete IT consulting and services. Our skilled professionals offer network installation, problem solving, ongoing maintenance, custom servers, integration of vital components, and training for all levels of expertise. © 2008 Actnet. All rights reserved. All other trademarks are the property of their respective owners.